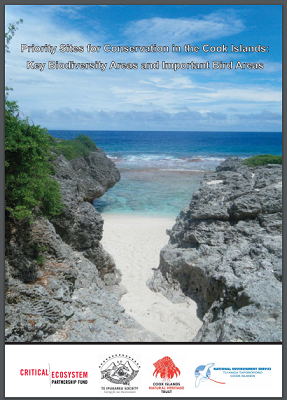 In 2010, with the assistance of Conservation International and the Critical Ecosystems Partnership Fund, Birdlife International in partnership with the Cook Islands environmental NGO Te Ipukarea Society commenced a project to identify and delineate KBAs and IBAs in the Cook Islands. A Project Steering Committee was established which together with international biodiversity experts from Birdlife International and Conservation International, forms an expert network. The first task was to identify species in the Cook Islands listed on the IUCN Red List as critically endangered, endangered or vulnerable. Endemic species listed in the Cook Islands National Biodiversity Strategy and Action Plan (NBSAP, 2002) were added to this list because they meet the restricted range criterion. In the Cook Islands, seabirds are known to be most likely to meet the criterion of globally significant congregations. Sites that qualify for this criterion must have at least 1% of the global population of seabirds or at least 10,000 pairs on a regular basis. One percent thresholds are tabulated in Appendix 3 for species that may lead to IBA designation in the Cook Islands. Bottleneck sites must have threshold numbers of migratory species. With the assistance of the Packard Foundation, population estimates were made of seabirds on islands most likely to meet IBA criteria and for which population numbers have not recently been assessed (Karika, 2011). The Cook Islands do not qualify under the criterion of bioregionally-restricted species assemblages. Except for Rarotonga, the small size of the islands (100ha to 5,200ha) and the widespread distribution of some species on each island mean that it is sensible to make the entire island a KBA/IBA. Such delineation is important considering that each island must be managed as a single unit where the introduction of invasive species can have a devastating effect on the biodiversity. For the Rarotonga Marine KBA, delineation is seawards to the greatest depth where the species listed can be found (450 feet or 151m). The entire reef area that encircles Rarotonga is delineated as the KBA (1600ha).